The Percona Live MySQL Conference 2014 is less than two weeks away, running April 1-4, and excitement is building for the great lineup of speakers, events, and networking opportunities it offers. This year’s conference also features the first-ever Open Source Appreciation Day, which takes place on March 31, 2014, and includes two separate events, CentOS Dojo Santa Clara and OpenStack Today, highlighting these two key technologies. A new keynote address about the OpenStack ecosystem by Boris Renski, a member of the OpenStack Board of Directors, has also been added. I look forward to keynotes this year from Oracle’s Tomas Ulin, Fusion-io’s Nisha Talagala, Dropbox’s Renjish Abraham, Big Fish Games’ Sean Chighizola, Continuent’s Robert Hodges, and Percona’s Peter Zaitsev. This year we will also feature a keynote panel on “The Future of Operating MySQL at Scale”. I will host the panel which features Robert Hodges, Nisha Talagala, and Peter Zaitsev, and will focus on the challenges of operating MySQL at scale when downtime is very costly for mission-critical applications and more and more companies running MySQL in the Cloud. We will discuss topics such as high availability clusters, multi-datacenter replication, and data storage in addition to other important future challenges. A new keynote has been added on Friday, April 4, 2014 about OpenStack. Boris Renski, OpenStack Board Member and CMO of Mirantis, will present “OpenStack Co-Opetition, A View from Within”. He will discuss the competitive and cooperative nature of the OpenStack ecosystem and touch upon topics such as TROVE which is relevant to Database-as-a-Service in relation to OpenStack. •	CentOS Dojo Santa Clara – This free event, offered in cooperation with CentOS, brings together the CentOS community to discuss systems administration, best practices and emerging technologies. Due to space constraints, attendance is limited to 75 people and advanced registration is required. The event will take place from 10:00 a.m. to 6:00 p.m. in Room 203 of the Santa Clara Convention Center. •	OpenStack Today – This free event is offered in cooperation with members of the OpenStack community and will provide an opportunity to hear from leading industry technologists who will speak about today’s fastest growing open source cloud infrastructure project, OpenStack, and how MySQL fits into the evolving OpenStack roadmap. Due to space constraints, attendance is limited to 100 people and advanced registration is required. The event will take place from 1:00 p.m. to 6:00 p.m. in Room 204 of the Santa Clara Convention Center. Attendees who register for one of the two Open Source Appreciation Day events can use the discount code “OPEN” to receive a 15 percent discount on their Percona Live MySQL Conference and Expo 2014 registration. Registration for either of these events includes a free Expo Hall and Keynote Pass for the Percona Live MySQL Conference and Expo. 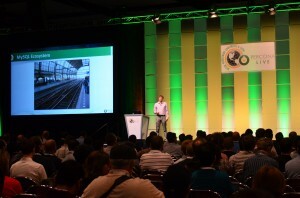 Both the Lightning Talks and BOFs are a perennial crowd favorite at Percona Live conferences. The always entertaining Lightning Talks are an opportunity for attendees to propose, explain, exhort, or rant on any MySQL-related topic for five minutes. Topics might include a new idea, successful project, cautionary story, quick tip, or demonstration. Lightning Talks will take place Thursday night, April 3, 2014, during the MySQL Community Networking Reception, which begins immediately following the breakout sessions. Birds of a Feather sessions enable attendees with interests in the same project or topic to enjoy some quality face time. This year’s topics include MySQL 5.6 in production, best practices for MySQL data replication, extreme MySQL performance, and much more. We’ve even added a BOF on OpenStack this year. The BOFs will take place Wednesday night, April 2, from 6:00 p.m. to 7:00 p.m. BOFs are open to all members of the MySQL community, whether you attend the conference or not. The Percona Live MySQL Conference and Expo is a great place for networking, providing attendees with the opportunity to make connections that can help enhance their career, facilitate a current project, or inspire new ideas. This year we have a Welcome Reception on Tuesday night and the Community Networking Reception on Thursday night. Pythian is organizing the community dinner this year on Wednesday night, following the BOFs. For a complete list of events and times, see the Conference Program. Visit the Percona Live MySQL Conference and Expo 2014 website for more information and to register. I hope to see you in Santa Clara in two weeks!